How Far Should You Travel To Get The Best Deal On A Car Purchase? The car market is more like real estate than a lot of people realize; location has a lot to do with how much you will pay. The good news is if your local market is tough, you can buy a car from wherever you want. How much you can save could depend on how far you’re willing to go. I talk with car buyers every day, and it amazes me how many people are not willing to take a bit of a drive to save a significant amount of money. I tell people to think of it this way: Would you drive a two-hour round trip if someone were to give you $500? That’s $250 an hour just for driving! Most people would say yes, and driving a few hours could save you not only hundreds, but potentially thousands of dollars. If you want to get the best price on your next car I strongly suggest casting a wide shopping net. For some people this might be a one or two hour radius, for others it might be larger depending on their local market. The reason behind this is simple: the larger your travel radius the more dealerships within that range and the more dealers you have to choose from the easier it is to leverage prices against each other. For example, if you were to shop locally for a Mazda there may be only one or two dealers in your area and they may even have the same owner. 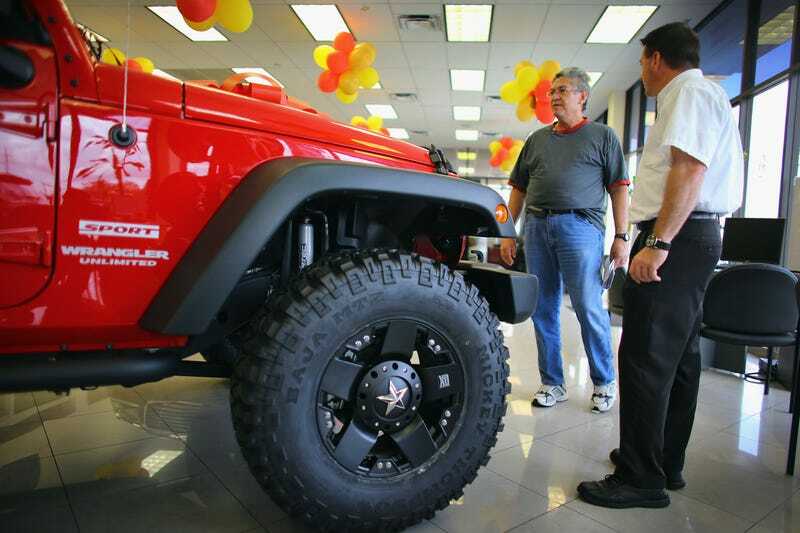 These dealerships may not be as competitive on price as another store that is further away. A while back, I mentioned how difficult it can be to buy a Honda (or any car for that matter) in NYC. The main reason being that despite the high density of dealerships, the NYC metro area has a huge population and if a dealership gets hundreds of suckers walking through the door everyday, they don’t have to haggle with a smart buyer on the internet. New York car shoppers may be better off taking an hour or so drive into South Jersey, Pennsylvania, or even Connecticut to land a deal. On the opposite end of the spectrum, I had a client in Iowa shopping for a Nissan. There was only one dealer within a two hour drive and as you can imagine, if a dealer knows they are the only game in town for a particular brand, they don’t have to be very flexible on price. Due to the lack of competition in their local market, these folks were willing to drive several hours to some of the larger metro areas like Chicago, Milwaukee, or Des Moines. I can’t stress this one enough, no matter how friendly the salesperson is or how committed they are to a “top notch customer experience.” the last thing you want to do is drive a long way to a dealership only to find out that the price you were told has changed or the car you wanted is no longer available. You already know to get quotes in writing, but make sure the out-the-door price is accurate for your local sales tax and DMV fees. Some dealers, out of habit, will calculate the total based on their local figures. This is why you should send them your zip code and request an itemized breakdown of the fees to double check the math. In addition to the price quote, have the dealer send you a copy of the build-sheet or window sticker and make sure the the price is aligned to a VIN or stock number. This prevents them from playing a bait and switch on pricing. Tell them you will be traveling and ask if they would be willing to hold the car with a small deposit via credit card. Whether you are located in a market where dealerships have plenty of “easy targets” like New York City, or are stuck in the middle of nowhere, you can use the quotes from the distant dealers against the store that is most convenient for you. Again, just like the dealership far away, make sure you have this dealer send you an out-the-door quote in writing with all of the taxes and fees spelled out. If the local dealer is smart, most of the time they will match the price or come very close. However, some dealerships depending on their size and sales volume, have more wiggle room than others. A large dealership that moves a lot of units can afford to sell cars for less because they will get a volume bonus from the automakers. If your local dealership is small, they just might not have the ability to match the price of a larger store near a big city. Also be aware that if you are bringing something to trade this can complicate things a little bit. If the dealer 20 minutes down the road low-balls your trade, it’s easy to walk away. If the dealer two hours away does so, that puts you in a tough spot. One way to minimize this is to get a variety of quotes for your trade in writing. Take your car to a dealer that sells the same brand, ask if they are willing to buy it and give you an offer. If you have a CarMax or a WeBuyAnyCar location nearby, these places will give you a written quote that you can take with you. Their numbers might not be the most competitive, but at least it’s something in writing that you can use to leverage against a dealer that is far away in case they offer you a ridiculously low trade value. Worst case scenario is you drive all the way home with two cars and sell your old ride on the private market. A dealership three hours away in Virginia was able to discount the car by almost $3,000 and had access to a different lender for the lease that was able to use a higher residual value. This resulted in a monthly lease payment that was $90 less per month than the local dealer. This guy saved a total of $3,240 for driving a six hour round trip. That’s $540 an hour. Not too bad. On the other hand, I had a customer who wanted a brand new Subaru Impreza and was absolutely determined to get the lowest price possible. He was willing to drive several hours to get the best deal. That level of flexibility is great, but the Impreza is a car with minimal markups so the amount of potential savings isn’t as great. After I found him a price from a nearby dealership that was under invoice, he told me about a dealer four hours away in New England that had an advertised price of $200 lower than what I found. I explained that even we assume the advertised price is true, driving eight hours round trip and paying for gas food and tolls is going to negate that $200 savings. Not to mention that is essentially a whole day spent on the road and at the dealership just to save a few hundred bucks. I don’t know too many people that want to blow a whole day just to buy a car when they could be doing more enjoyable things. The next time you are car shopping set a wide travel radius that is comfortable for you. Try to use best quote against the local dealer and see if they will match it. If they don’t, run the numbers on how much you will save and see if it is worth it. Saving money is great, but not when it’s at the expense of your own time and energy.